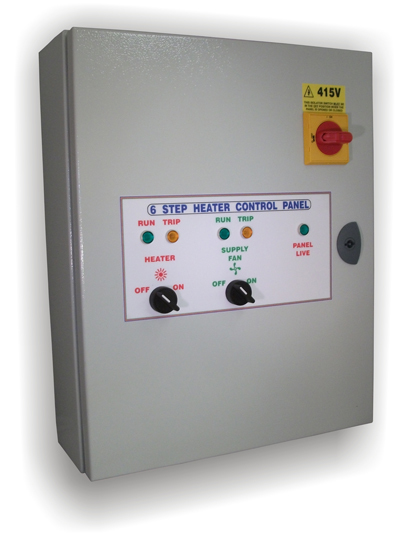 Our 6 step heater control panel is designed to control an electric heater in six single phase steps, up to 18kW. The control panel also controls a single phase supply fan 6amps as standard (give fan details when ordering if different), with fan run on timer. The control panel comes with a duct sensor. The supply fan has an on/off switch on the panel facia, and individual run and trip indicators, the supply fan also has a two minute run on timer. The heater is interlocked with the supply fan, and can only be on when the supply fan is running. The temperature is controlled by the SB55 pcb, this is done in six stages, the SB55 monitors the supply air via a duct sensor fitted in the duct at least 2M from the heater battery. The heater can be switched on and off by the facia mounted heater switch and has run and trip indicator lamps on the panel facia. The control panel is designed to be wired into the buildings fire alarm circuit, this will shut the panel down in the case of a fire. Have a question about Sarum 6 Step Heater Control Panels? Please fill out the form below and we will get back to you.